★★★☆☆ A weighty Beethoven cycle lightened by the surprise appearance of an Australian composition. 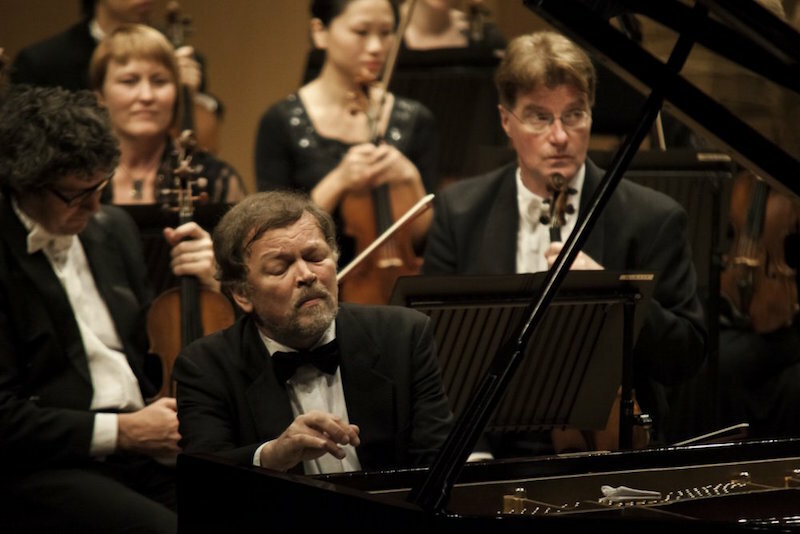 This concert completes Nikolai Demidenko’s 2016 performance of all five Beethoven piano concertos with the Queensland Symphony Orchestra and conductor Vassilis Christopoulos. I had the pleasure of reviewing the first part of the cycle in May, so I was looking forward to seeing this concluding performance. This concert is structured identically – both involve the piano concerti of Beethoven and a selection of overtures. On the previous occasion, the music was paired with beer courtesy of a local brewery. I’m slightly saddened that there isn’t an accompanying beverage this time. The concert begins with the Egmont Overture. This started life as essentially background music for a production of Goethe’s Egmont, for which Beethoven provided an overture, as well as various bits of music to accompany the dramatic action. Given that this is Beethoven we’re talking about, there’s drama a-plenty, and QSO is in fine form throughout the performance. In several of the Maestro series performances, QSO has been including short pieces by Australian composers as a sort of bonus. Oddly, this wasn’t announced until later in the concert; perhaps someone forgot to hand over the microphone. In this case, the piece was an effective work by Joe Chindamo called (as far as I could tell from the belated announcement) Siren’s Air. I loved the diaphanous woodwind lines that kept popping up again and again, which had an edge of dissonance that spiked the piece rather nicely. The concert continued with Beethoven’s Piano Concerto No. 2. Oddly, this is actually Beethoven’s very first concerto – he composed it in the late 1780s, but the so-called Piano Concerto No. 1 was published first. It’s clear that Beethoven knew the concertos of Mozart well, since there’s more than a few echoes of Mozart in this. Perhaps it’s for this reason that Beethoven himself doubted the work, saying that he did “not give it out as one of my best”. However, even second-rate Beethoven is better than most – this is music of cheer and vitality. The (quite valid) theory goes that this piece was written to show off in front of the Viennese audiences. I’d have liked more daring in some of the melodic turns – this piece is Beethoven the enfant terrible doing his best to show off – but it came off a little safe. However, Demidenko played the piece with a delightfully light touch. This is, despite Beethoven’s doubts, a fine piece. After the interval, QSO began the second half with another overture, the Leonore No. 3. Beethoven’s work seemed to spur the orchestra on, and there were some colossal forte and subtle piano sounds in this performance. The Piano Concerto No. 5 Emperor was a fine performance, but at this point the orchestra was noticeably flagging in some areas. Orchestral tuttis were fine, but there were several points where what should have been pin-point precise entrances were…not. Perhaps this was simply due to an excess of Beethoven? Like the previous concert in the cycle, this is almost too much of a good thing. I dearly love the music of Beethoven, but four pieces in a row is rather intense. Chindamo’s work provided an excellent contrast, but that still left a solid two hours or so of nothing but Beethoven, and most of that with piano. Surely one of the lighter symphonies would have made a good contrasting piece? These were good, solid performances, but some sort of other compositions to throw Beethoven into relief would have made me happier with the concert overall. After all, variety is the spice of life.